The easiest solution is to mount your speakers on the wall. Or position the speaker at the correct height using a floor stand. Vogel’s has a suitable speaker stand or wall bracket for virtually every speaker. The latest addition is a table-top stand for Sonos PLAY:1 and PLAY:3. Vogel’s has dedicated speaker supports for Sonos PLAY:1, PLAY:3, PLAY:5, Denon HEOS 1, HEOS 3, HEOS 5, HEOS 7 and all universal mid and large speakers available at the market. So, look at your choice of speaker and match it with the best solution in your home! Vogel’s supports you, no matter what! 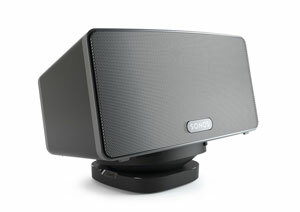 Avoid damage to your Sonos speaker by safely placing it on the SOUND 4113 table-top stand. This new stand allows you to turn your speaker 360° and tilt it up to 10°. With this table-top mount you get more out of your Sonos PLAY:1 or PLAY:3 speaker! Determined to find the perfect acoustics for his favourite jazz music, our founder, Harry Vogels, developed the very first speaker wall bracket almost 45 years ago. Throughout the years supports and brands changed and from 2015 onwards all wall mounts and stands were developed for the new era multi-room loudspeakers such as SONOS.